Early printed book. First edition, second issue. 345 x 232 mm. - With over 1400 woodcut illustrations composed to 227 fully decorated pages. Sigismondo Fanti’s 'Triompho di Fortuna' was the second illustrated fortune-telling book to appear in print. Fortune-telling books like the present Triumph of Fortune were very popular in the late 15th and 16th centuries. Fanti’s book works as a game that gives the reader the opportunity to ask questions about the future, and get answers after going through the five sections of the book. Each step is determined by either a roll of the dice or the time of day at which the book is consulted. 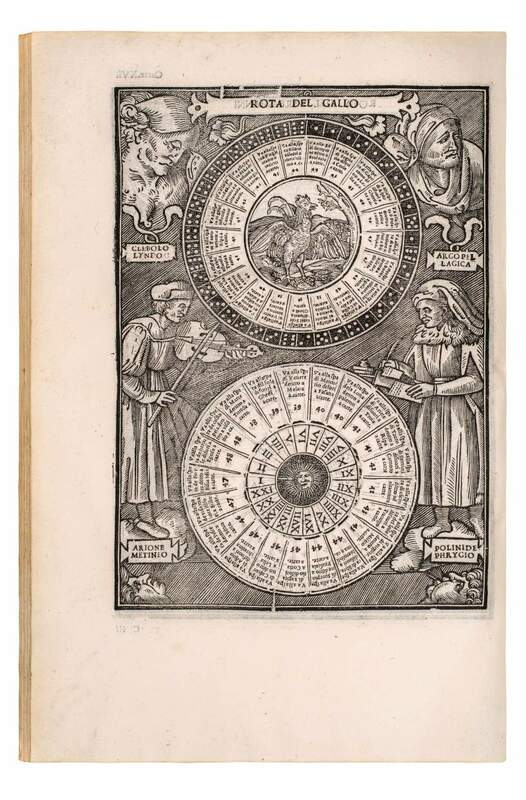 Based on a choice of seventy-two questions, the path leads from twelve figures of Fortune to twelve houses, then to wheels, spheres, and, finally, to ancient and modern astrologers and sibyls, who respond to the opening questions in Italian quatrains. In contrast to other fortune-telling books, which mostly concentrate on private interests, such as love or health, Fanti’s work regards many serious questions affecting society, such as war, trade, or religion. Moreover, the system of finding and interpreting the answers is considerably more complicated and imprecise than other fortune-telling books. This might be a reason why the Triumph of Fortune, as far as we know, was not reprinted. Two ‘issues’ of this first edition are known, the only difference between which is the year given in the colophon: M.D.XXVI or M.D.XXVII (as in the present copy). Both issues were published in January 1527. This abundantly illustrated book consists almost entirely of woodcuts, beginning with an elaborate allegorical title-page that points to the basic aspects of the work. The celestial sphere, belted with the zodiac and carried by Atlas on his shoulders, has here the function of the Wheel of Fortune, turned by an angel on one handle and a demon on the other. On top of the sphere – quite an insecure position – sits a pope accompanied by the allegorical figures “Virtus” and “Voluptas.” The astrologer in the foreground can be interpreted as the author, Sigismondo Fanti, and the pope may be the recipient of the dedication, Clement VII. The monogram IM on a tablet, presumably the signature of the block-cutter, has not yet been identified.